How do you solve crimes after you have smoked 5 - 6 joints during the day? - or for that matter manage to brush your teeth. This was the first question I asked myself as I got into this poor man's 'Chandler'. The 'gumshoe' in this California 'noir' smokes his pot like Marlowe smoked cigarettes. More power to him ,but it makes for pretty tedious reading when all he seems to do is 'flash up' the next number , then we get "stoned think", his stoned thoughts on God, the universe, the munchies and the case at hand. I surmised that the early 70's California weed must have been very mild due to the amount he consumes and still stays upright. Perhaps if our hero, Doc Sportello, had been a bit straighter he may have sorted this very ordinary plot out quicker than the 366 pages it takes him. Its a strange book set in about 1970. Why its set there I do not know,and there is no clue. The constant references to the pop icons of the era - i.e Ginger and others from Gilligans Island -are just plain annoying. My age group may remember this stuff but to most younger people none of the television, music or movies constantly referred are well enough known to have any meaning. At the end of the book, after many digressions, all we have is a story about heroin and bad guys. with Doc Sportello getting his chick back! 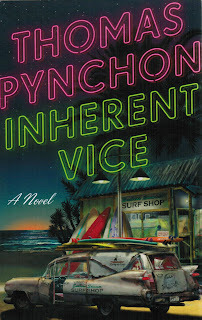 I don't know if Mr. Pynchon imbibes but it gives the impression of being written by a stoned person. Things start up all the time but never go anywhere. This purchase wasn't a complete waste of $34 but close, a few laughs saved it from getting packed straight off to the church jumble sale.